On Monday, March 28th, 2016, at 6:05 p.m. a Dubuque Police Officer heard what he believed to a be a gunshot in the area of 19th & Jackson Streets. Another officer observed two males at 20th & Washington Streets and approached both. The males refused to comply with the officer’s lawful orders and fled the area, one wearing a backpack. The male with the backpack, later identified as Demarcus D. Timmons, 03/21/96, of 2017 Washington Street, was relocated and arrested a short time later in the 2000 block of Jackson Street, but without the backpack. The other male was later located in the 300 block of East 22nd Street. He continued to be uncooperative and resisted the officer who was forced to tackle him. While attempting to take this male into custody, the officer sustained abrasions to his hand, arm and face. This male was identified as Joseph M. Smith, 06/22/90, of Chicago. Smith was arrested and charged with Interference With Official Acts Causing Injury and Interference With Official Acts (Providing False Identification Information) after he provided officers with a false name. During the investigation, a citizen approached an officer and advised where the backpack had been discarded. A search warrant was obtained for the backpack and officers located a stolen handgun inside. Timmons was subsequently charged with Theft 3rd Degree (by possession), Possession/receipt/transportation/dominion and control of firearms by felons and others (control of a firearm by someone convicted of domestic violence and/or subject to a protective order), and Interference With Official Acts. Timmons later admitted to possessing the backpack and gun while knowing he was prohibited from doing so due to a previous domestic assault conviction and judge’s order prohibiting him from possessing a firearm. 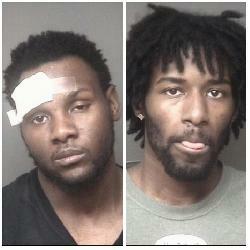 Both Timmons and Smith are being held in the Dubuque County Jail on $30,000 and $5,000 bonds respectfully. The firearm possession charge is a Class D Felony punishable by a fine between $750 & $7,500, and imprisonment up to 5 years. Theft 3rd Degree is an Aggravated Misdemeanor punishable by a fine between $625 & $6,250, and up to 2 years imprisonment. Interference With Official Acts Causing Injury is a Serious Misdemeanor punishable by a fine between $315 & $1,875, and imprisonment up to 1 year. Interference With Official Acts is a Simple Misdemeanor punishable by a fine between $65 & $625, and imprisonment up to 30 days.